Putting Yacht 51 problems aside for one moment I would like to add a note of optimism and excitement to this Jeanneau 51 yacht thread. This coming Tuesday I take delivery of my new Yacht 51, being a realist I understand that like a marriage it will start with undying love and affection until it mellows into the reality of a compromised partnership, a partnership of ongoing maintenance, repairs and upgrades in return for moments of shear pleasure with pride and satisfaction of ownership. My hull number is 85 and I can only hope that some of the problems experienced here, (that I would rate as mild) would have been ironed out by now, only time will tell. Like all the contributors posting here I will post from time to time the good the bad and the ugly. However, the underlining sentiment seems to come through of a well sorted boat which is why I chose this above many other manufacturers and models in my price range. You will love it, it is really awesome yacht, guarantee. There are issues with every yacht and frankly dealer support is good at least from our experience. You have 3 or 4 owners on this board to ask questions, which I am sure you will have. I also just posted bunch of pictures from the last season. Just a question on AIS, I need to program it, easy enough, having done it before on previous boats, but......where on earth is it located, neither the commissioning team or the dealer seems to know where it is. 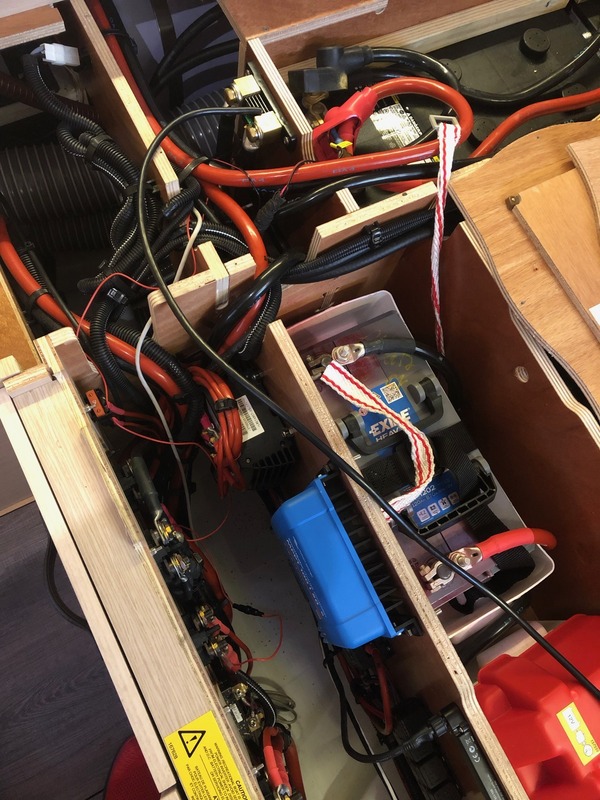 I have looked in the cupboard on the port side and removed the cover to expose the battery chargers and I have done the same on the starboard side. I have looked behind every panel near the chart table but still can’t find it, can any one help! Fabrice, j’ai vu la page et c’est correct, merci beaucoup. Ania thank you also, I thought about unscrewing that side but thought the fuel tank took up all the space. Guys, check your sliding compartment door, if that stopper falls out, like in my case and drain hole gets plugged with debris, whater will flow in large quantities into engine compartment, and than everywhere else. Sorry I didn`t undestand your picture and your explanation , could you please send more detais where this problem happened ? 1) the drop wash board being dropped on that white acetal "bumper / stopper" enough times to knock it out of position exposing the two screw holes where the stopper is fixed with two screws and silicon. 2) the drain hole and the bottom of the connecting hose where it is fixed to the through hull valve can easily get blocked with fluff/dust/ fine rubbish causing the sump under the fwd cockpit floor bin to fill with water after rain or a cockpit wash.
A) Took a little more care lowering the wash board so as to avoid a hard impact with the stopper. B) Re-fixed the acetal stopper with larger and longer screws with a good application of sikaflex. C) Regularly clean the sump area so fine debris can't block the drain or hose. To assist this I cut a large (approx 150mm) hole in the middle of the bin floor so I could install an inspection plate like used on dinghy bulkheads to access inside their flotation tank. This access is right over the drain hole and much easier to access than the two other smaller access holes closer to the edges. Seems to have solved the problem as long as we remember to check the sump area regularly. 1) I did have the two small ceiling panels at the fwd end of the VIP cabin fall. 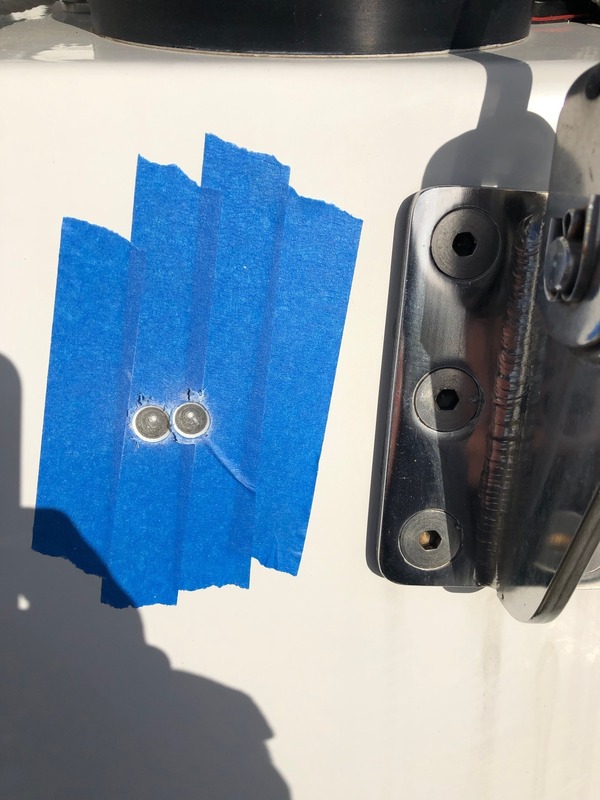 It was fixed under warranty - I asked the Sydney Jeanneau agent to fix them with screws with the little white button covers. 2) Both sides of my Acrylic window panels have a warp (slight bubble) where the slots are. I haven't done anything about this aesthetic problem yet seeing if it develops further. 3) We haven't seen any bimini or dodger mould but other than maybe a different climate ours are not factory options but made from a sunbrella fabric by a Sydney specialist organised by the Sydney Jeanneau dealer Performane Boating during our yachts commissioning in June 2017. The dodger in particular is a very different style to the factory version and the bimini is shorter than the factory version with a bigger infill - you may see this in the photos of our yacht in the photo section. Stunning photos, is that the standard boom? looks fantastic, guess you could walk on it for needed? Panels do fall, look at the beginning of this thread, they have to be screwed on and that’s how dealers MX people fix it. what Acrylic panel are you talking abut? Next water issue is dinghy davits. Jeanneau already scratching their heads, it won’t be an easy fix for sure. They are talking about drilling channels, which I am not so sure about. It’s not as bad with davits retracted, but once they are extended, water simply flowing into underneath compartments. Where did you source the wings for the boom? Our boom is a Z-Spar "Park Avenue" or "canoe boom" - Z-Spar also make the other spar components for the J51 (mast, furling main boom and classic mainsail boom and vang). These canoe booms are on the options list for the Jeanneau Yacht 58 and although not on the price list for the J54, most of the stock photos of the J54 show a canoe boom installation. Jeanneau directed me to Z-Spar as they hadn't tested it on a J51 and wouldn't offer it (even though I knew it worked on a SO509). So I sent an email to Z-Spar attention Rémi who not only replied but he bent over backwards to provide us with the canoe boom to match the J51 and send it out with the boat. The boom is the same boom section as the classic main boom with Al extruded wings welded to the boom section then the whole boom is painted. The spring in the vang has to be a higher capacity to handle the increased boom weight. 3) each "wing tip" has two grooves - one for the sail bag and one for our boom tent that runs from the mast to the front of the bimini - in Cruising mode very necessary in Australian summers. 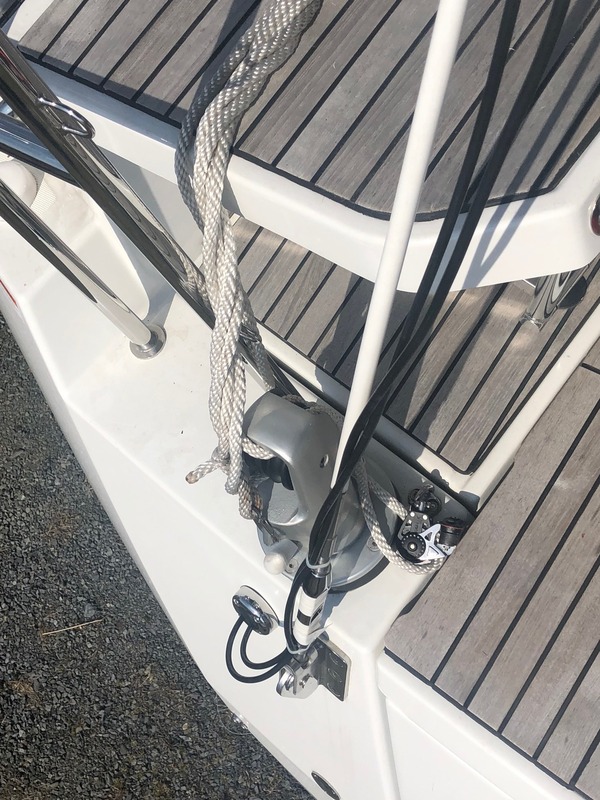 4) in racing mode we drop the sail bag and lazy jacks onto the boom "curved platform" and put belts over the top (groove to groove as the straps slide into bottom groove). - see second pic link in post above as you can see the main bag folded and secured not interfereing with lamellar flow at the foot of the main. BTW - we thought Rémi was the most patient and helpful sales guy ever but we found out after the boat arrived that the very approachable and supportive Rémi is in fact the Director General of the Z-Spar Group !! Please see the reply to Malcolm above for some info. The wings are not available as stand alone items but as part of Z-Spars "Canoe Boom" range. We had discussed with Rémi buying the wings but he explained that the whole process of welding the wings to the boom section without section distortion etc was part of the development technology for these Park Avenue style booms compared to the carbon versions construction and associated prohibitive cost. Many thanks for this posting, how I love this forum! 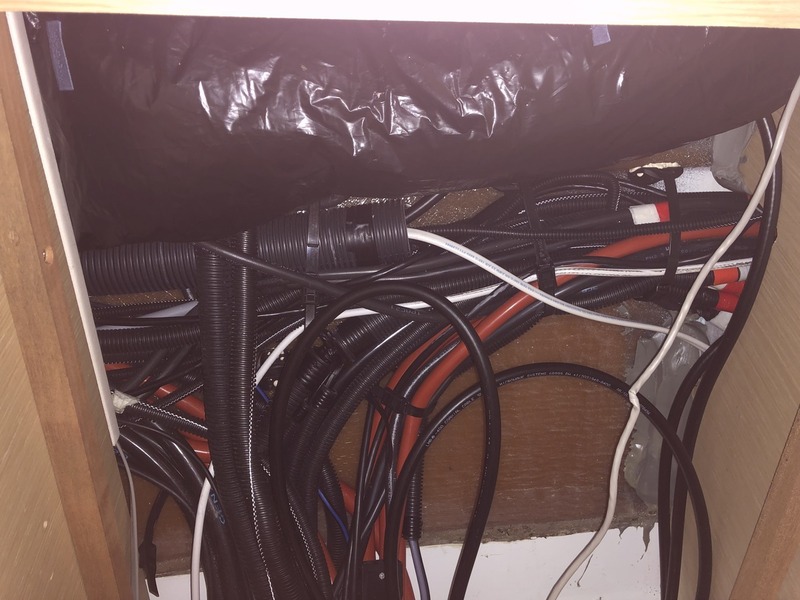 When I found the location where this picture was taken I had a peek under the false floor of the locker at the top of the companionway to discover my drain was also blocked (not leaves and rubbish but broken bits of wine glasses......no further comment on that one) and the locker was filling with water. 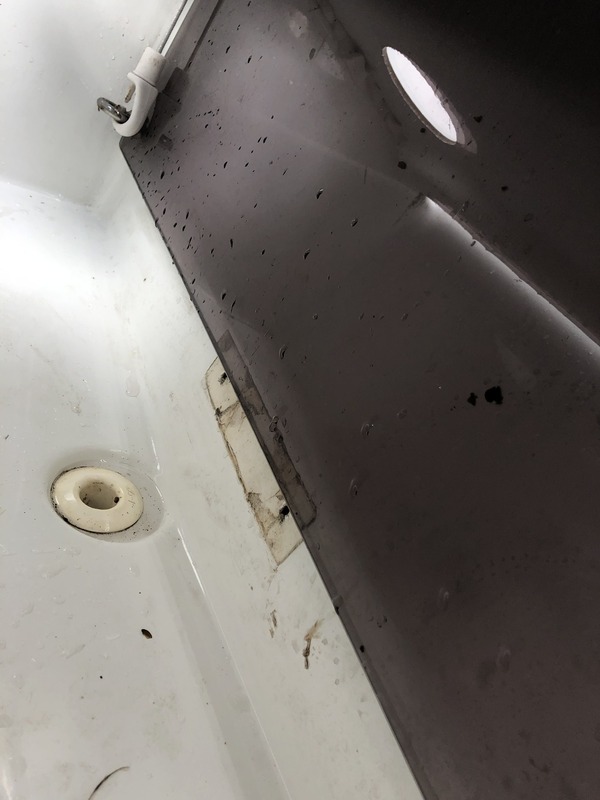 Also found out the seacock under the sole at the foot of the companionway beside the motor inlet was not the generator but this cockpit drain, I had closed it. once again many thanks, must go I'm now looking for the generator sea water inlet. Ania, just one observation, your perspex slide up washboard looks like it is tinted and very dark, mine is clear? Yep, ours is dark(tinted), don't close that through hull, it drains water ;-) Generator intake is in starboard aft cabin next to engine inspection panel. Nice job on the solar Ania - very neat installation and good amps. I note the tape to avoid chipping the gel coat by the drill bit. We had a 10mm gel coat crack that the guy who installed the BBQ bayonet on the stern caused by drilling through the gel coat (now fixed). The bit spiral can grab the thin gel coat and cracks it. I think I have finally finished my projects after an inner removable forestay addition and boom tent. I found a better photo of Beyond Cool in racing mode with the sail bag dropped and held on the canoe boom (600mm wide) with clip straps - you can just see five of them connected to the bottom wing groove. Thanks ania, most appreciated. Also your posting on the solar installation will be very helpful towards my own future installation thoughts. By way of sharing our various solutions, below is a depiction of our solar setup. 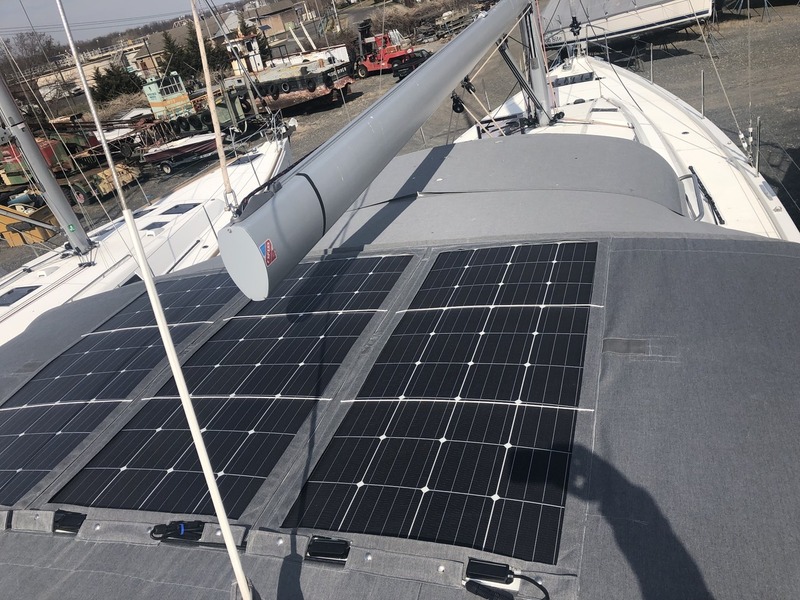 Not as neat or the capacity as Latitude 25's flexible setup Ania put together but we have an Australian built bimini which is full width but much shorter than the factory option with a larger infill. As a result the available length and curvature of the bimini led us to opt for a single high capacity solid panel fitting between the backstays. On a sunny day with reasonable elevation (say between 10am and 2pm) we see around 8amps into the house batteries. The system has a Victron MPPT 100/50. 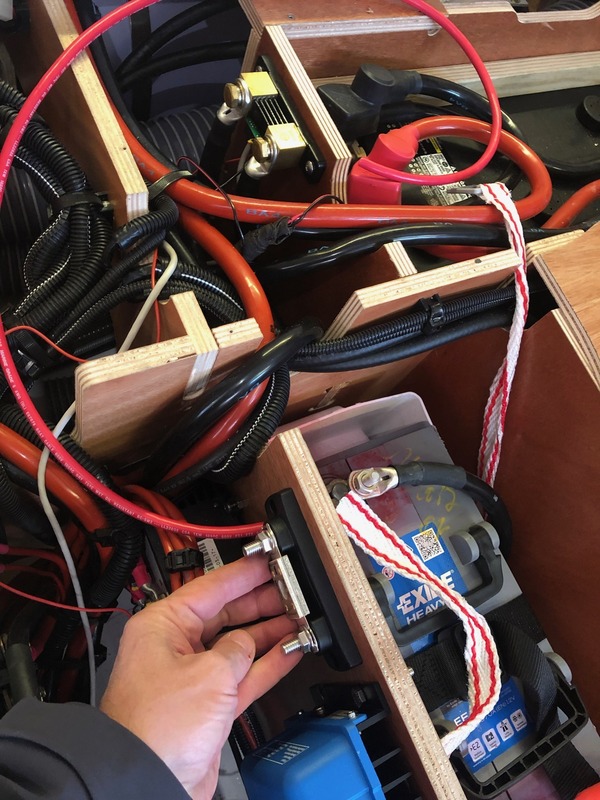 Because we also have a Victrom Digital Multi Control 200/200, Victron Multiplus (3000va inverter and 120 amp charger) for the house system and a Victron BMV 712 battery controller. we display all the system status on a Victron colour control GX panel.